T HE HISTORY OF ENGLISH PLAYING CARDS dates probably from the mid 15th century, the first documentary evidence of their existence in this country occurring in an Act of Parliament [3 Edw. IV. c.4] which, upon the petition of domestic card makers, prohibited the import of foreign cards. Some 20 years later, we learn from the Paston Letters that the family played cards on a festive occasion. Court accounts during the reign of Henry VII refer to the Queen's debt at cards. But still we have no direct evidence of what the cards themselves looked like. 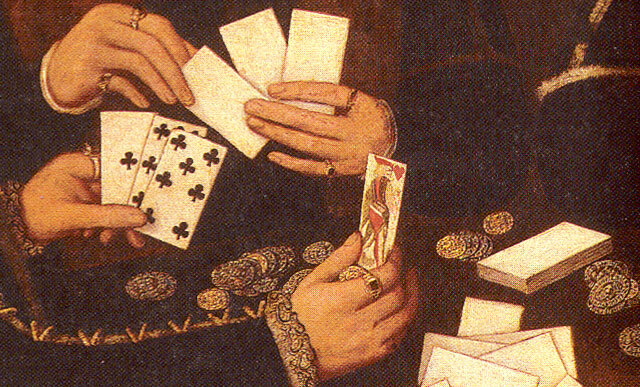 Above: four cards showing how modern anglo-american playing cards evolved from late fifteenth century French cards. The so-called 'Suicide King' originally held an axe. Cards made in Rouen at that time were an eclectic mixture of features from cards made for various foreign markets, hence the origins of what became the "English" pattern are not one precise source, but a mixture of several earlier regional patterns. Other examples of early Anglo-French cards also show details which appear in English cards. It seems reasonable to suppose that they resembled the earliest designs which we know to have come from France (see illustrations right), which have subsequently evolved into the English pack. Designs by Valery Faucil of Rouen (c.1500), by Jehan Henault of Antwerp (1543) or by Pierre Marechal of Rouen, made some 20 years later, are known. Other early cards exist in museums and libraries. the nomenclature is highlighted by the popularity in the past of such imported games as Ombre and Primero. In the mid-17th century the Puritan regime was doubtless responsible for the destruction of thousands of packs, gambling being regarded by half the country as frivolous and immoral, although the manufacture of cards was permitted. Thousands of packs must also have been destroyed during the great plague of London (1664-1666) and in the Great Fire of London (September 1666). It is not until the restoration of Charles II that we find any sort of order and continuity in the history of the publication of playing cards, or, indeed, surviving examples of full packs. The sale of playing-cards is only for a brief interval. It is most brisk for a couple of weeks before Christmas, and is hardly ever attempted in any season but the winter. The price varies from 1d. to 6d., but very rarely 6d. ; and seldom more than 3d. the pack. The sellers for the most part announce their wares as "New cards. New playing-cards. Two-pence a pack." This subjects the sellers (the cards being unstamped) to a penalty of £10, a matter of which the street-traders know and care nothing; but there is no penalty on the sale of second-hand cards. The best of the cards are generally sold by the street-sellers to the landlords of the public-houses and beer-shops where the customers are fond of a "hand at cribbage," a "cut-in at whist," or a "game at all fours," or "all fives." A man whose business led him to public-houses told me that for some years he had not observed any other games to be played there, but he had heard an old tailor say that in his youth, fifty years ago, "put" was a common public-house game. The cheaper cards are frequently imperfect packs. If there be the full number of fifty-two, some perhaps are duplicates, and others are consequently wanting. If there be an ace of spades, it is unaccompanied by those flourishes which in the duly stamped cards set off the announcement, "Duty, One Shilling;" and sometimes a blank card supplies its place. The smaller shop-keepers usually prefer to sell playing-cards with a piece cut off each corner, so as to give them the character of being second-hand; but the street-sellers prefer vending them without this precaution. The cards - which are made up from the waste and spoiled cards of the makers - are bought chiefly, by the retailers, at the "swag shops." Playing cards are more frequently sold with other articles - such as almanacks - than otherwise. From the information I obtained, it appears that if twenty dozen packs of cards are sold daily for fourteen days, it is about the quantity, but rather within it. The calculation was formed on the supposition that there might be twenty street playing-card sellers, each disposing (allowing for the hinderances of bad weather, &c.), of one dozen packs daily. Taking the average price at 3d. a pack, we find an outlay of £42. The sale used to be far more considerable and at higher prices, and was "often a good spec. on a country round." Excerpt from Henry Mayhew's "London labour and the London poor", first issued (serially) in the 1840s, but in 1851 the work was re-issued in three volumes. Information courtesy Anthony Lee. from those created in the imagination, such as hide and seek, to those using pieces of paper, sticks or sophisticated manufactured items. Some games recreate the thrill of sporting activities, whilst others give a sense of creativity. A few can even cause anger and frustration. Children's card games have been somewhat neglected in the past. They are distinct from ordinary playing cards, with their most obvious difference being the lack of any court cards or suit marks. Instead game cards are either numbered, lettered or grouped in some other way. Children's card games used to be produced to very high quality, both in the materials used and the design and printing. Economic circumstances change, and children's card games today vary in quality and educational value.